With the Mariners, Iannetta will likely replace Mike Zunino as the every-day catcher and try to rebound from an abysmal 2015 season where he hit .188. 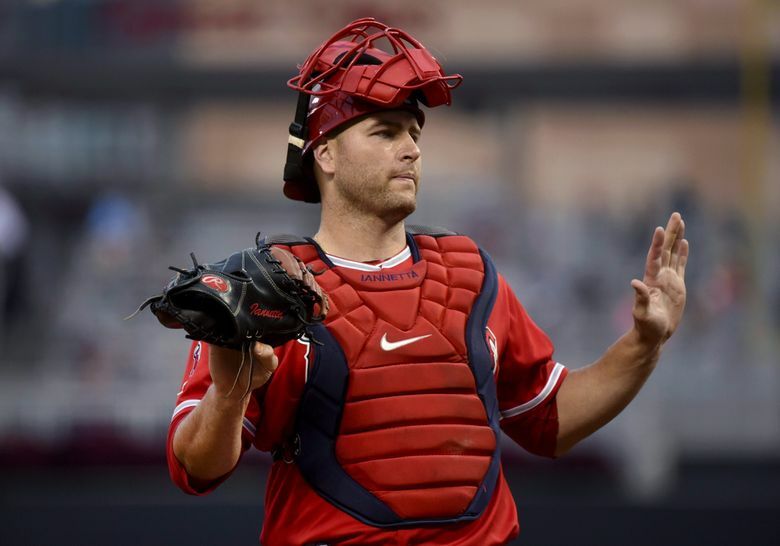 The Seattle Mariners have secured their opening-day catcher for the 2016 season. On Monday the team announced the signing of free agent Chris Iannetta to a one-year contract. Jon Heyman of CBS Sports reported that the contract was for $4.25 million with an option year. Mariners general manager Jerry Dipoto said there also is a team option for 2017 that can turn into a vesting option based on games played in 2016. Finding a viable veteran catcher for the season had become one of Dipoto’s top offseason priorities. Iannetta, 32, fills that need, having caught 852 games in his 10-year career and posting a .232 career batting average. In the Mariners, Iannetta found a place where he can be the No. 1 catcher and try to rebound from an abysmal 2015 season in which he hit .188. To make room for Iannetta on the roster, the Mariners designated catcher John Hicks for assignment. Hicks, 26, played in 17 games with the Mariners, 10 starts at catcher. He hit .063 (2-for-32) with a double and a RBI. In 83 games with Class AAA Tacoma, he hit .245 with 15 doubles, a triple, six homers an 35 RBI. He was fourth-round pick for the Mariners in the 2011 draft. As general manager of the Angels, Dipoto acquired Iannetta, who he had worked with in Colorado in the minors, from the Rockies for pitcher Tyler Chatwood. So he has some familiarity with his skill set. Iannetta’s hitting numbers have slowly declined each year, not surprising for a catcher. This past season he hit .188 (51 for 272) with 10 doubles, 10 home runs and 34 RBI and .628 OPS in 92 games with the Angels last season. Multiple professional scouts commented that those numbers should go up moderately, viewing last season as somewhat of an outlier. The numbers aren’t inspiring, but given the Mariners’ current catching predicament, they might be an improvement from last season. Dipoto was confident that Iannetta can rebound. Mariners catchers combined to hit .209 last season with a .464 OPS, striking out a ridiculous 178 times. So he’s still a vast improvement. Much of the blame has been placed on Mike Zunino — the Mariners’ catcher of the future. Zunino had a horrific sophomore slump and struggled for much the season, striking out once in every four at-bats and hitting under .180. The Mariners were so thin at the position that they acquired veteran Welington Castillo from the Cubs to be a backup and possible replacement. Instead, then-general manager Jack Zduriencik traded Castillo 10 days later in a multiplayer trade that brought back designated hitter Mark Trumbo and pitcher Vidal Nuno. With Castillo gone, the Mariners tried to acquire another catcher via trade, but the market was overvalued because of a lack of quality catching, and the Mariners were wise not to grossly overpay. There were no viable everyday replacements within the organization. The team hoped Zunino could fix his issues as the season went on, but after Zduriencik was fired, Zunino was sent to Class AAA Tacoma and then to the Mariners’ spring training facility in Peoria, Ariz., to overhaul his swing. The hope is that Zunino, 24, and a revamped swing can find some confidence this season. But the Mariners ideally would like to start him at Class AAA Tacoma to keep minimal pressure on him while he tries to implement the changes. Iannetta plans to help Zunino in any way he can this spring. He found personal similarities in Zunino. “I’ve watched Mike catch the last couple years, and I’ve seen him getting better behind the plate year in and out,” Iannetta said. “And that doesn’t happen without a lot of hard work. I don’t know Mike very well. But if you get better behind the plate, you are definitely putting in a lot of time and effort in. It translated to him doing a really nice job behind the plate. “Offensively, catching behind him when he was hitting, I would see a lot of the same things I kind of felt when I was young in Colorado. I see a lot of similarities. He’s going to be a really good player. It could be this year when he figures it out and takes off. It could be next year. But it’s going to happen. He’s too talented and works too hard for it not to happen.